Abstract: EGR systems have been commercialized as a NOx reduction method for a wide range of diesel engines from light-, medium- and heavy-duty diesel engines right up to two-stroke low-speed marine engines. A number of considerations must be taken into account when designing EGR systems including: deposit accumulation, contaminants, engine lubricant, system packaging and more. The main components of EGR systems are EGR valves and EGR coolers. Other specialized components are possible in certain types of systems, such as venturi mixer devices or EGR pumps. Heavy-Duty Engines. 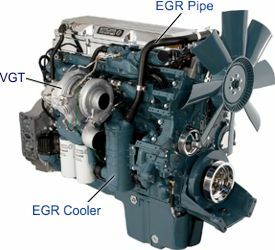 The EGR system for the DDC Series 60, Figure 1, is an example of the systems applied in many heavy-duty engines in North America for MY 2002 and later. The EGR system is a high pressure loop (HPL) system where a portion of the exhaust is taken from upstream of the turbocharger. The variable geometry turbocharger, among other tasks, ensures that the pressure difference between the exhaust and intake manifolds is positive to ensure adequate EGR flow is available when required. The EGR then flows through an EGR cooler provided with water from the engine jacket water. From the cooler, the EGR flows through an EGR pipe to the other side of the engine to a venturi-type flow meter that provides a feedback signal for monitoring the EGR rate. An EGR control valve located just before the mixer housing is responsible for controlling EGR rate. The EGR then passes to the intake manifold where it mixes with cooled charge air before being inducted into the engine. The EGR valve detail of Figure 1 also shows an EGR heater plate that is intended for use at low ambient temperatures. The heater plate heats the EGR passing through the valve to ensure that ice does not form in the mixer housing. 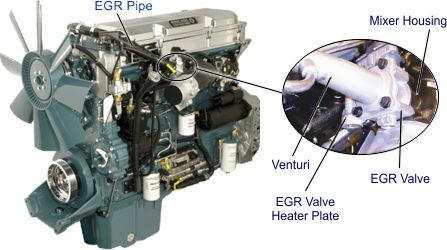 A number of changes occurred in this EGR system from its introduction in 2002. Older versions of this engine (US EPA 2002/2004) had the EGR valve located on the inlet side of the EGR cooler. Early versions used a pneumatically actuated valve that was replaced with a hydraulically actuated valve and finally, the electrically actuated valve shown in Figure 1. Some versions also used pressure taps upstream and downstream of the EGR control valve to monitor the pressure differential across the valve for EGR rate feedback instead of a venturi-type flow meter. By 2008, the venturi flow meter was removed entirely. Another example of a cooled EGR system for heavy-duty engines is the Scania Euro IV system illustrated in Figure 2. Pre-turbine (HPL) exhaust is routed via an EGR control valve and an EGR cooler to the engine inlet system. Engine jacket water is used as the cooling medium in the EGR cooler in this example as well. In general, EGR can be cooled with engine coolant, ambient air or a low temperature liquid. Light-Duty Engines. The application of EGR is not limited to heavy-duty engines, but extends to engines powering light-duty vehicles as well. 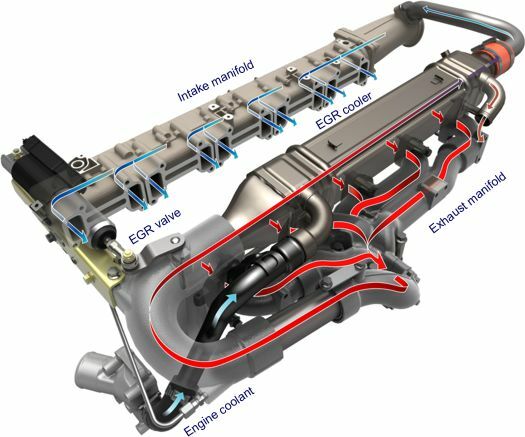 Figure 3 is a schematic representation of a passenger car type EGR system from the Audi 3.3 L V8 TDI Euro 3 engine introduced in 1999  . The EGR system is a high pressure loop, cooled EGR configuration. A portion of the exhaust is channeled through an EGR control valve and proceeds to the EGR cooler. From the cooler, EGR flows to a throttle valve assembly where it is mixed with filtered, high-pressure, fresh combustion air that has been cooled by an intercooler to recover some of its density. The mixture of air and EGR is then inducted into the engine through the intake manifold. While the engine is equipped with a variable geometry turbocharger (VTG) that can create a higher exhaust manifold than intake pressure to drive EGR, the intake throttle is used under some conditions when it is not possible to create a sufficient differential with the VTG. This system is very similar to EGR systems used in other Euro 3 as well as EPA Tier 1 and Tier 2 Bin 10 applications. In the early 2000s, there was some belief that future engines with higher EGR rates would require some form of EGR pump to achieve the required engine-out NOx emissions demanded of future emission standards. A HPL EGR system supplying these high EGR rates would result in an unacceptable fuel economy penalty. However, instead of a pump, many of these systems ended up using a hybrid configuration such as that illustrated in Figure 4 for the 2.0 L Volkswagen TDI engine introduced in North America for MY 2009 EPA Tier 2 Bin 5 applications. The HPL EGR is controlled by the HP EGR valve and by the turbocharger vane position. The HPL EGR is used at lower engine speeds and loads. At higher engine loads and speeds, the EGR supply is shifted to the LPL EGR system. 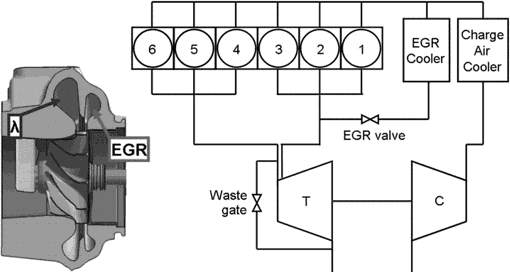 Although not shown, the LPL of the EGR system in Figure 4 includes an EGR filter (Figure 25). VW 2.0 L TDI engine. Position of valves 1, 2 & 3 is typical for LP EGR operation at high engine speeds and loads. At low engine speeds and loads, valve 3 is fully closed and valves 1 & 2 are both open to enable HP EGR operation. Daimler’s asymmetric turbocharging system is illustrated in Figure 5. High pressure EGR is supplied to all 6 cylinders from only 3 of the cylinders. The fixed geometry turbocharger turbine is a twin scroll design but the scroll for the cylinder supplying EGR is smaller in cross-sectional area to enable a higher back pressure to be generated by these cylinders and ensuring adequate EGR flow over a wider range of operating conditions than would be possible with a fixed geometry turbine having equal scroll sizes. This approach avoids to need to use a variable geometry turbine. The other larger scroll can be optimized for scavenging of the other three cylinders  . Two-Stroke Low Speed Engines. For low-speed two-stroke marine engines designed to burn heavy-fuel oil (HFO), the EGR system can become quite complex owing to the need to clean the recirculated exhaust gas of harmful metals and sulfur and the need to maintain the exhaust header pressure below that of the intake header to ensure cylinder scavenging. Figure 6 illustrates one such system designed for a retrofit application  . The main components are: scrubber, cooler, water mist catcher, blower, shut-down valve, change-over valve, water treatment plant (WTP) consisting primarily of the buffer tank, NaOH dosing system and water cleaning unit. A control system controls the amount of EGR, the scavenge air pressure, the NaOH dosing, scrubber water circulation and scrubber water discharge. Scrubbing can be carried out with sea water or fresh water. In sea water scrubbing, intended as the main operating mode, sea water is passed through the scrubber once and dumped into the sea. For a 20 MW main propulsion engine, a maximum of 900 m3/h sea water has to be pumped which represents about a 1% maximum fuel penalty. In fresh water scrubbing, used in areas where no discharge is allowed, about 99% of the scrubbing water is recirculated. As fresh water flows through the scrubber it becomes acidic from the sulfur in the exhaust gas. The NaOH dosing system is used to neutralize this acid. The buffer tank ensures a constant flow of water to the scrubber. A water cleaning unit (WCU) is used to remove particulate matter that becomes suspended in the scrubber water. The particulate matter is discharged as a concentrated sludge into the sludge tank on the vessel. The WCU is designed for cleaning the scrubber water to such an extent that it can be discharged into the open sea in compliance with IMO scrubber water discharge criteria. 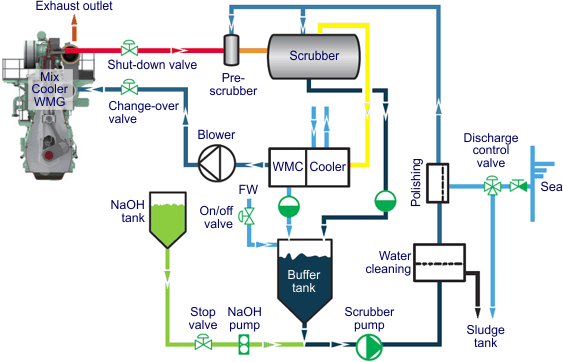 The maximum flow of fresh water through the scrubber is 200 m3/h at MCR (maximum continuous rating). As this is only around one fifth of the flow needed for sea water scrubbing, a reduced fuel consumption penalty will be result. However, to neutralize the acidic scrubbing water, NaOH is required. If running on HFO with a 3% sulfur content, a maximum NaOH consumption of approximately 10-12 kg/MWh would be required. Since fresh water scrubbing is used only during harbour or coastal sailing, the main engine power will be low and the sailing time will be short, further reducing the NaOH consumption. A typical arrival to port will be a maximum of two hours and 2-3 MW engine power, giving a total consumption of around 50 kg NaOH. For systems designed for marine fuel containing less than 0.5% sulfur, buffering is still required to neutralize sulfuric acid but water cleaning and sludge removal is not  .